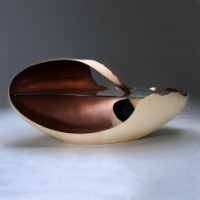 Gallery.ru / monxinh - Альбом "Marc Fish"
Nautilus II is made from more than 4,000 pieces of wood of walnut and fig tree oil to create a spiral inside this shell table. The table is designed according to the golden ratio with dimensions 200 x 150 x 45cm. This second version Nautilus will have five units were sold through the store Andrew Lamberty, London.